Hello, May! 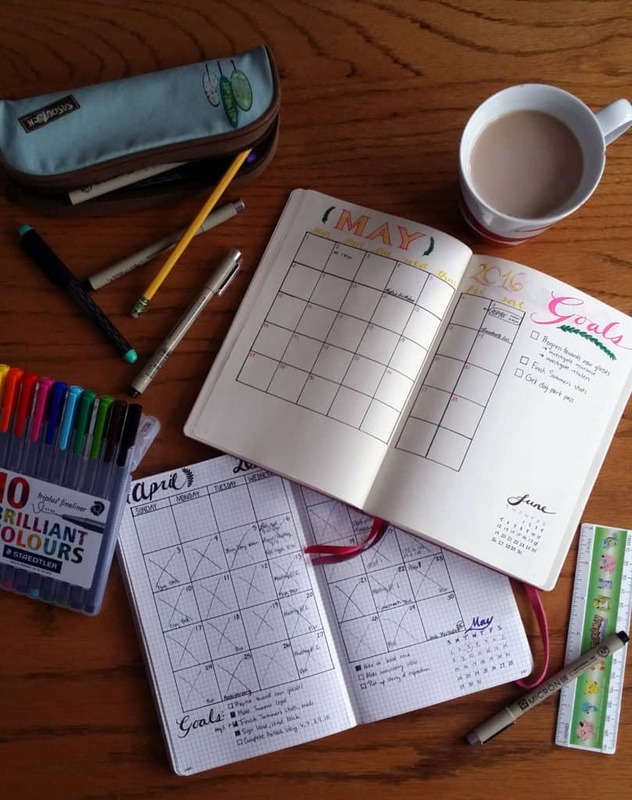 It’s so nice rolling over to a new month and getting to start a fresh new monthly spread in the bullet journal (Not sure what a bullet journal is? Learn more here). 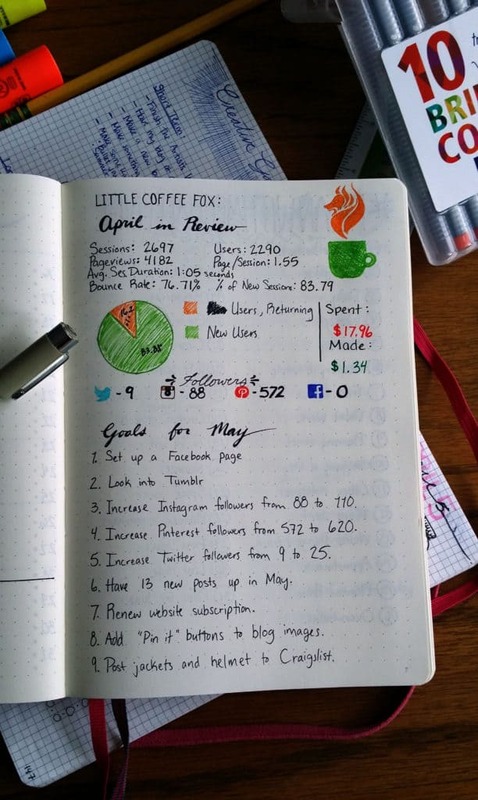 I can see how I progressed towards my goals in April and figure out how to move forward. It also helps me assess what is working well in my planner and what is not quite working for me. Let me show you how I set up my new month! I should mention that I have finally grown out of my Ecosystem and into a shiny new Leuchtturm 1917. Both are worthy journals, but I was feeling like trying something new and the Leuchtturm fit the bill. I am excited about trying a dot grid journal instead of a graph paper grid. First, I set up my calendar. Some people like to use the more simple, list-like monthly calendars, but I prefer to see the traditional layout. I write out my goals to the right, where I can look at my long-term plans. I migrate anything over from April that didn’t get done and write it out here. Below that, I like to have a little thumbnail of the next month. It is nice to have a quick reference of what dates land on which weekdays, especially when planning appointments. For drawing out my calendar, I used my Micron pens. They are incredibly handy for all the thick and thin lines needed for my spread. 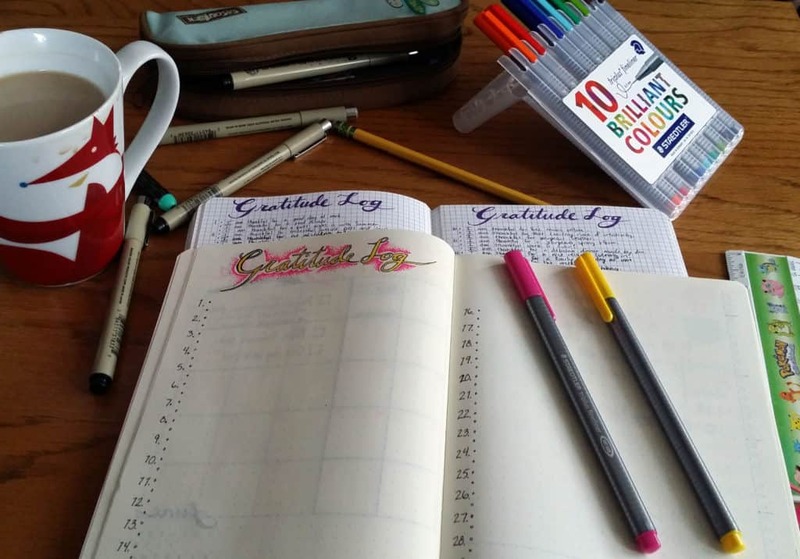 On the next page, I have my Gratitude Log, which has become a wonderful addition to my daily routine. I love being able to take a minute to be mindful each and every day for the blessings in my life. By the way, I used the Staedtler Triplus Fineliners to achieve this neat stippled look. After my Gratitude Log, I have my habit tracker set up on the next page. In my old journal, I didn’t have enough room on one page to have the tracker and all the labels, so I used two pages. Now I can use one page in my Leuchtturm to capture it all! Of course, it wouldn’t be a new spread without a goof. I forgot to label the page! Oh well, I suppose I’ll just have to deal with it. Silly me! The following pages are all new to me. It’s fun to try new stuff and see how it works in my day-to-day planning. So on the page next to my habit tracker, I have my blog statistics and goals page. I am trying to really pay attention and work for my blog, and this is one step towards being more mindful of what I need to focus on to really let it shine. I have all my stats from the month of April, including how much money I spent and how much I made. I also have all my social media followers listed to help give me a point of reference on what to pay attention to in the coming month. Then I wrote out all my goals pertaining to my blog. 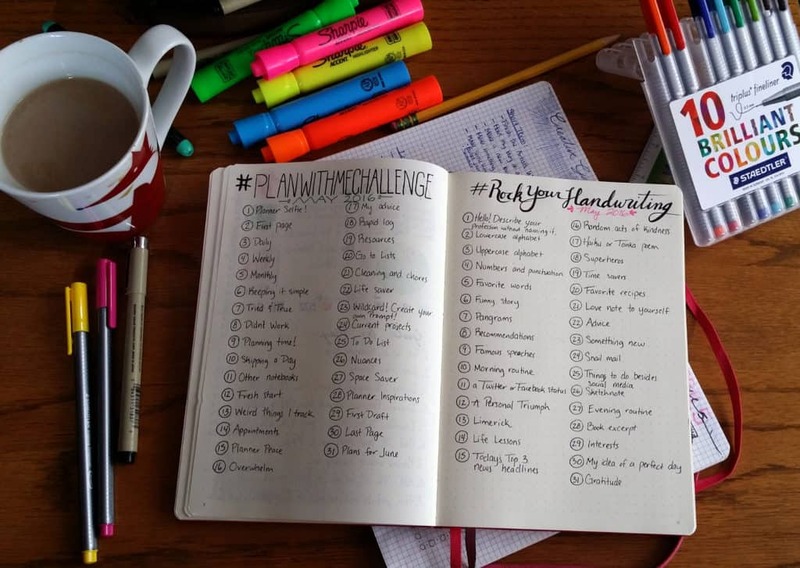 I hope to regularly reference back to this page to work on and eventually cross off my goals. You can see on the next two pages that I finally broke down and started the #RockyourHandwriting Challenge and the #PlanwithmeChallenge. I have been waffling with the idea for months, and I decided it was high time to commit and actually challenge myself! We’ll see how it goes. I’ll be posting daily updates of my progress with these challenge on my Instagram @Little_Coffee_Fox. So that is how I set up my monthly spread. It’s nothing super fancy, but it helps keep me on track and grateful for all the little things in my life that I would otherwise forget. I want to be better at so many things, and this helps me move inch bit by bit towards my goals. It’s so satisfying closing out a month and seeing how I’ve grown, and hopefully these new additions to my monthly spreads will make me grow in completely new ways! Hi, I’m from Mexico, I was searching for some organizational tips, and I found your blog! Congratulations! I love it, I love everything that you do. Keep doing that! I’m 20 years old, I’m in college and I also have to get organize with homeworks, job, friendship, love life and family time, so this is very helpful. Thank you. Thank you so much for your kind words 😀 I’m so glad you enjoy my posts! I appreciate you commenting and good luck on finding your organizational balance!